This one is sure to become a family favorite! I made this on a whim today. My toddler was taking his nap, my baby was happily cooing away…and so I went to work in the kitchen! Some of my best creations come spontaneously rather than from careful, conscious planning (though there are those as well). Often as I’m scanning the ingredients on hand in my fridge and in my pantry, ideas will jump out at me. Such was the case today. Two things initially stood out to me: Bone-in chicken and a can of chipotles en adobo. I instantly knew I wanted to use them…somehow. The clock was ticking…my toddler would be awake from his nap before long…so I grabbed the ingredients and set to work! Pacing myself, like a candidate on the TV show “Chopped”, I hustled about, grabbing this and grabbing that in order to get this dish finished on time. 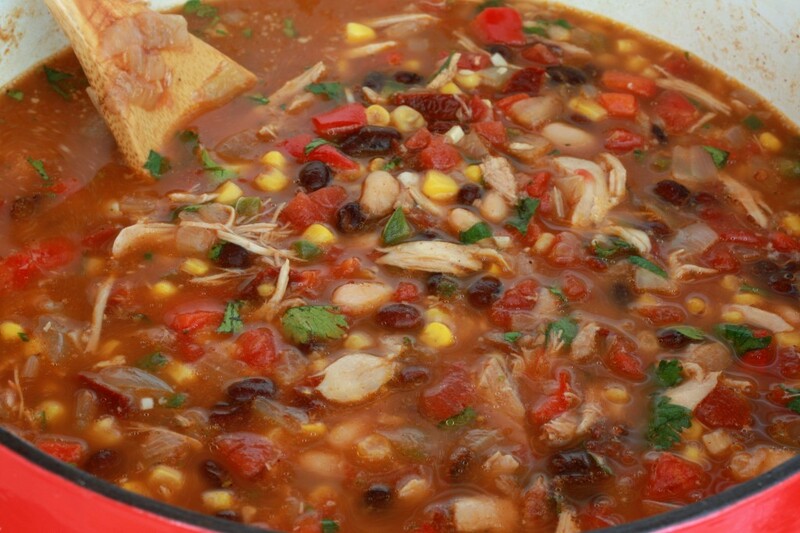 The end result: Smoky South of The Border Soup. You’re going to love this recipe. My in-home panel of food critics presented their verdict: It’s a winner! I love chipotles en adobo. They are smoked jalapeno peppers in a red sauce. The end result yields a smoky, rich flavor that literally transforms any dish in which they’re used. 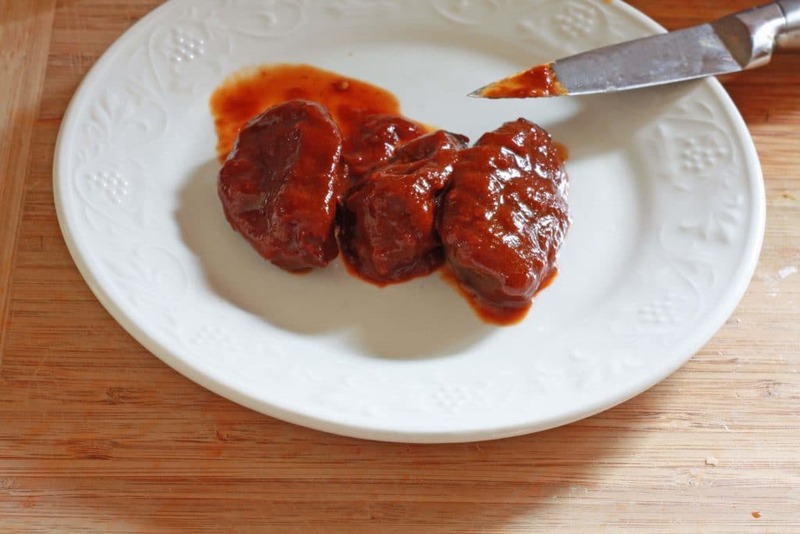 Although still spicy, some of the edge is taken off by the marinating process. 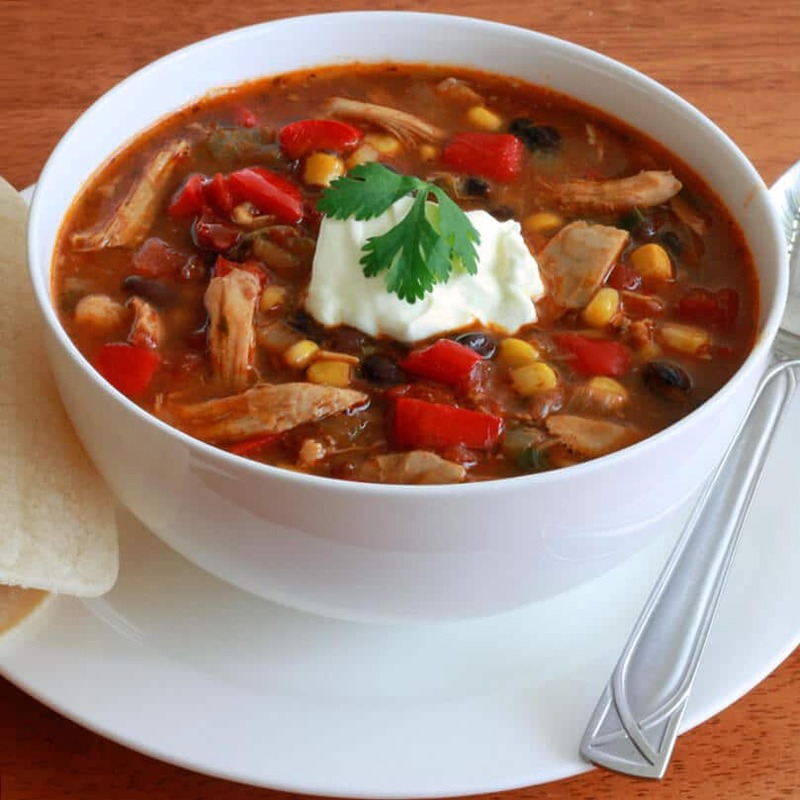 This soup is easy to make and, aside from preparing the homemade chicken broth, takes about 5 minutes to prepare and 25 minutes to cook. You can make the broth the day before to save time. Freezing broth is another great option, and that way you’ll conveniently have it on hand when you need it. Homemade chicken stock is the best. There just is no comparison. And since you have to cook the chicken anyway for this dish, why not turn it into a luscious stock? Place the chicken in a stock pot with 5 cups of water. 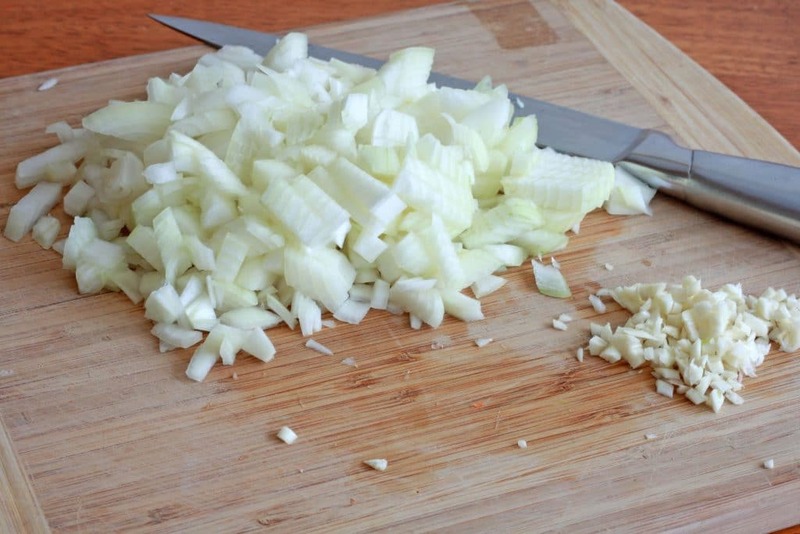 Add a stalk of celery and a carrot, cut into 2-inch pieces. Add a bay leaf and a few black peppercorns. Bring to a boil, reduce heat to low, cover and simmer for 1 hour. Discard the vegetables and bay leaf. Place the chicken on a plate, discard the skin, and shred the meat with two forks. Set the meat aside. Once the chicken stock has cooled, skim off the fat on top and discard. Set chicken stock aside. Heat the oil in a Dutch oven (I use and love Lodge) on medium-high and saute the onions until translucent and just beginning to caramelize. Add the garlic and jalapenos and cook for another minute. Add the red bell pepper and cook for another 3-4 minutes. Dice the chipotles en adobo. If you prefer your food less spicy, discard the seeds. 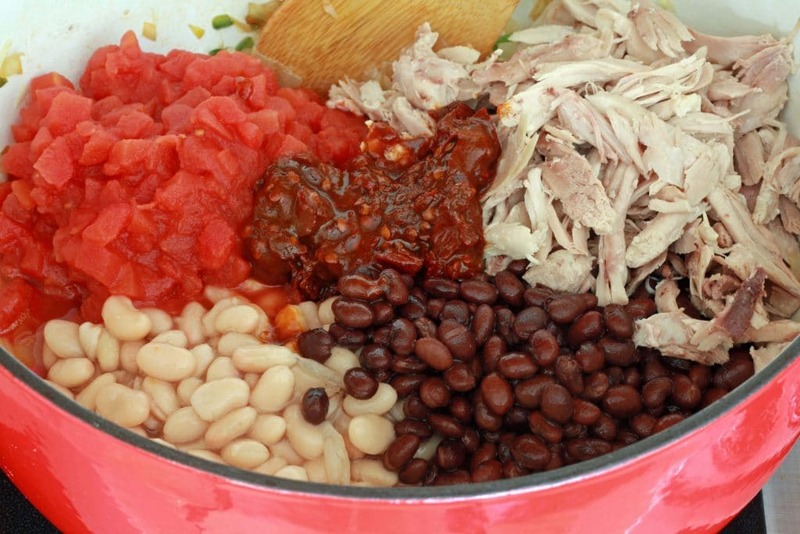 Add the beans, tomatoes, chicken and chipotles to the pot. Stir to combine. 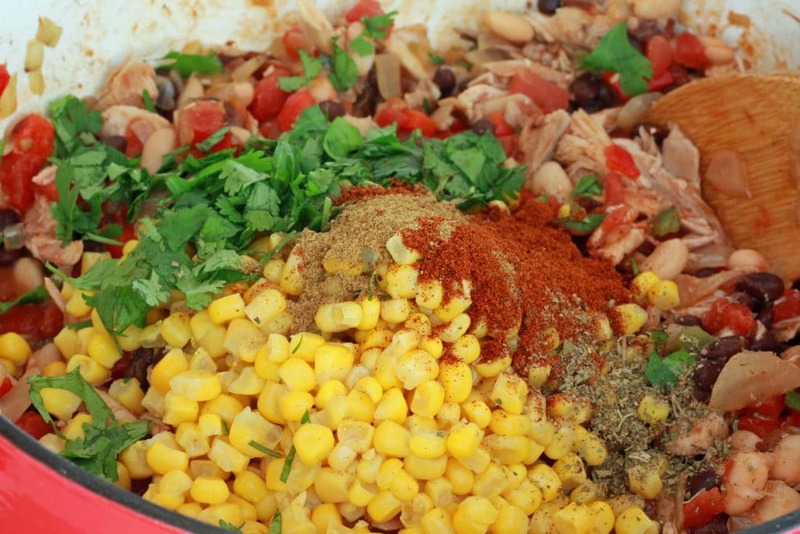 Add the corn, cilantro, spices, and chicken stock and stir to combine. 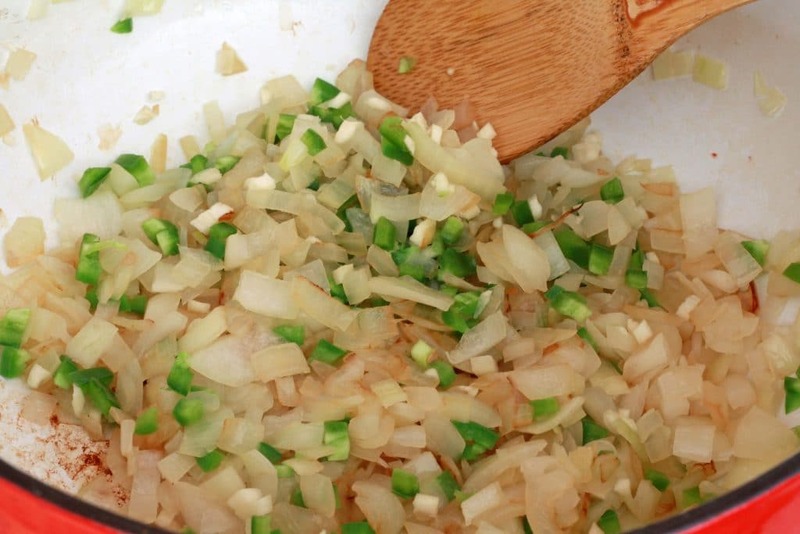 Bring the soup to a boil, reduce the heat to medium, cover and simmer for 25 minutes. Serve with a dollop of sour cream and some shredded Cheddar cheese, if desired. 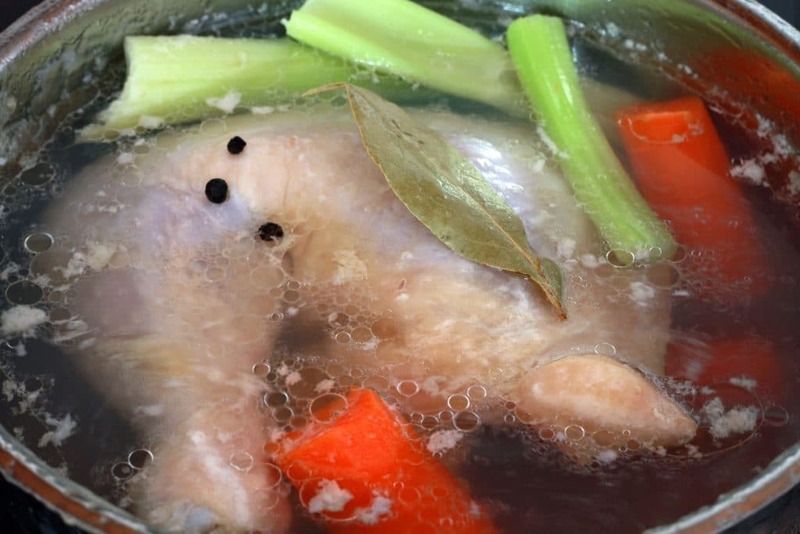 Place the chicken in a stock pot with 5 cups water. Add a stalk of celery and a carrot cut into 2-inch pieces. Add a bay leaf and a few black peppercorns. Bring to a boil, reduce the heat to low, cover and simmer for 1 hour. Discard the vegetables and bay leaf. Place the chicken on a plate and discard the skin. Shred the meat with two forks. Set the meat aside. Once the chicken stock has cooled, skim the fat off the surface and discard. Heat the oil in a Dutch oven on medium-high. Saute the onion until translucent and just beginning to caramelize. Add the garlic and jalapeno and cook for another minute. 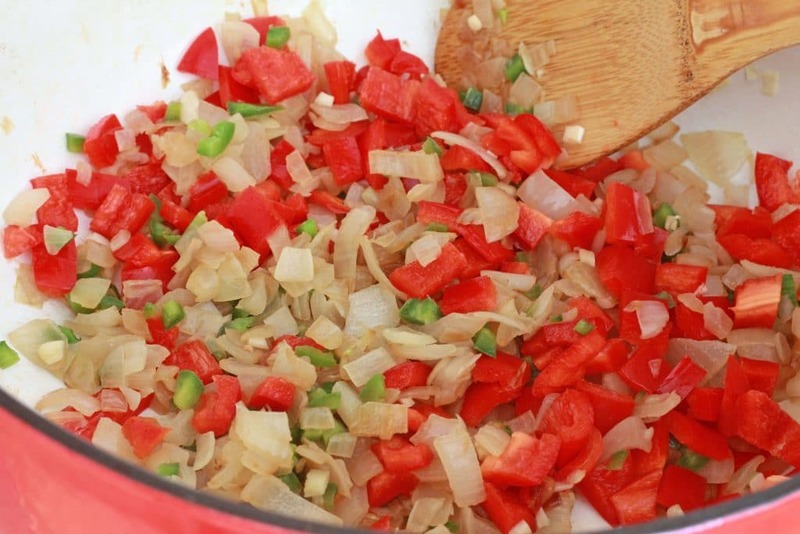 Add the red bell pepper and cook for 3-4 minutes. Add all remaining ingredients, bring to a boil, reduce the heat to medium, cover and simmer for 25 minutes. Serve with a dollop of sour cream and shredded Cheddar cheese, if desired. Hehe…well Kyle will eat everything I cook, but I always ask him to rate it in a scale of 1 to 10. There are many 8s and 9 s…but only like four 10s Hehe. 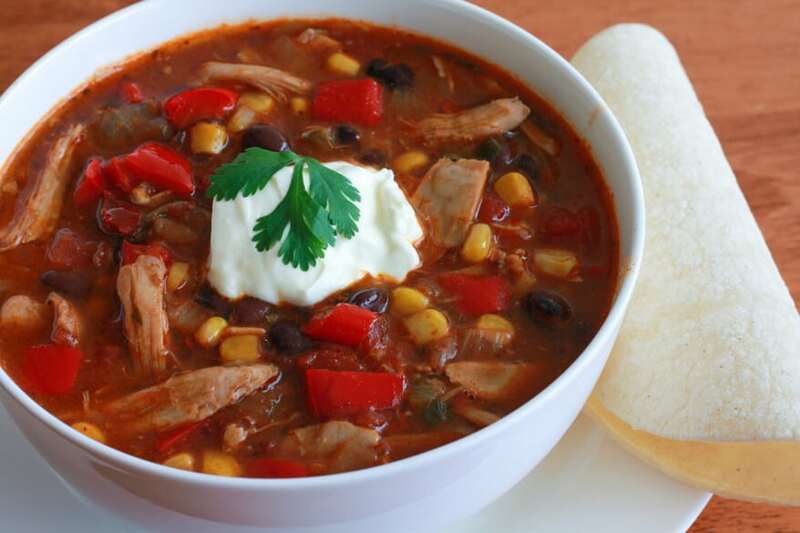 Great recipe, this soup looks so good! A great meal idea! Thanks, Jayne! Give it a try and let me know what you think! This is seriously my new favorite soup! I made it last night for the family and everyone loved it! Thank you so much for creating and sharing this recipe! This was dinner tonight. Totally yummy, and the adobe chili’s really do give it a smokey flavor. I didn’t have time time to do homemade chicken stock, but I used boxed chicken stock and it still tasted great. Really loved the soup for dinner tonight. I made a few small changes, including using beef and beef stock and a little wine (which makes lots of things better!) ,but that is all. We loved the smoky flavor of the adobe chipotles and the rich flavor of the onion, garlic, pepper beginnings. Nicely done! Thanks for the compliment and for your feedback. Shredded pork roast would be a nice variation as well. Or shredded turkey. 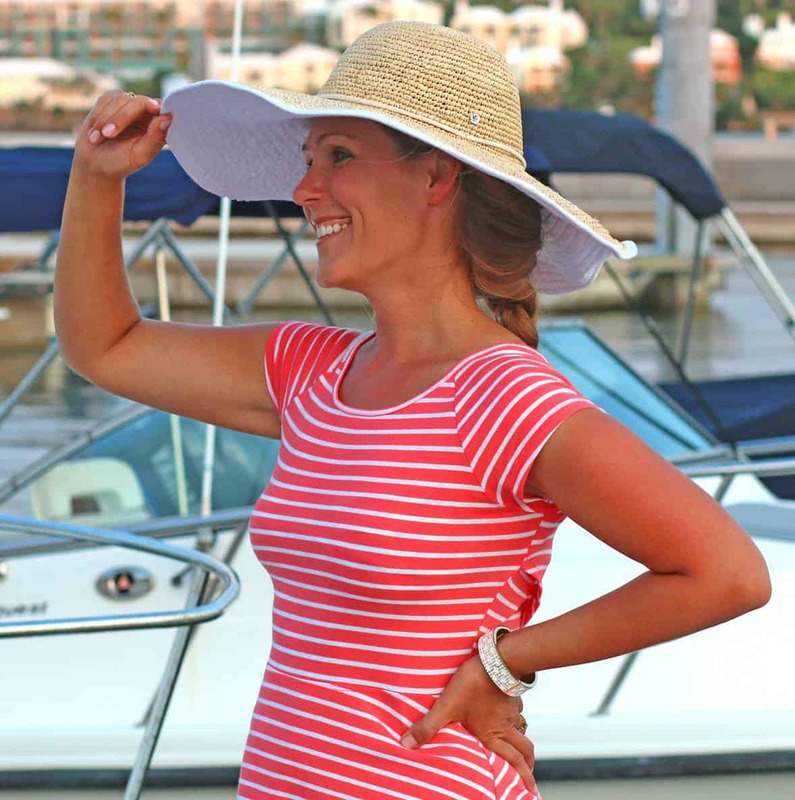 Hope you try some of the other recipes and let me know what you think! Will it still be delicious if I leave out the jalapeños? The fresh jalapenos? Absolutely still delicious! 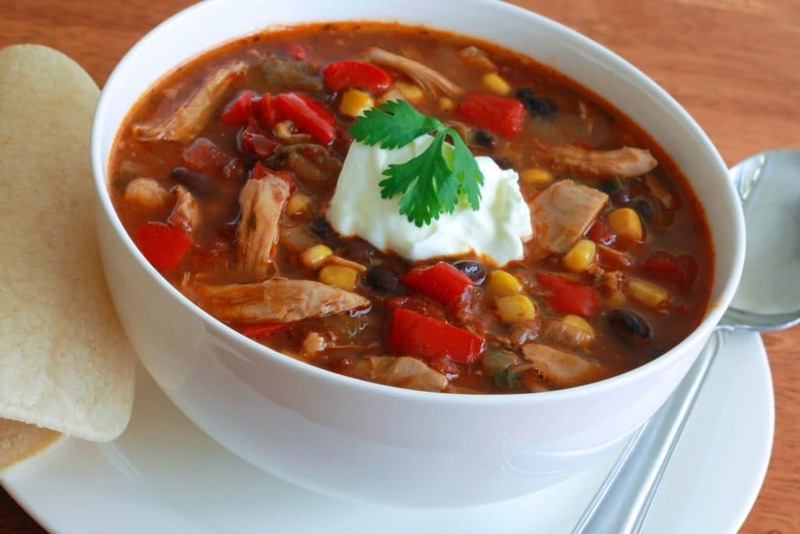 The chipotle chilies contribute such a fabulous flavor to the soup though, leaving those out will make a difference. The soup will still taste good without the chipotles but I highly recommend including those. The fresh jalapenos you can definitely leave out and not notice a big difference. I’m new to your website but I enjoyed “meeting” you. I can tell that you care not only about food but about the people who visit you. My husband and I can tomatoes every summer and I have noticed that many recipes call for adding sugar, but we started leaving it out years ago and actually like the end result better. Thanks for the recipe, it’s going in my monthly rotation! Hi, welcome and thank you for the compliment. I’m glad you enjoyed the soup. The touch of sugar has to do with the chemistry of food and the cooking process: Adding a very small amount of sugar to some dishes helps reduce the acids in certain ingredients and brings out the flavors in others. Your concern about diabetes – let me put this into proper perspective: The entire pot of soup only has one teaspoon of sugar and that’s divided into multiple servings – hardly a concern for pre- or full-diabetics. I can assure you that the diabetic epidemic here in the U.S. isn’t because home cooks are adding the occasional teaspoon of table sugar to their dishes. Let me provide some additional perspective: Apple juice, something most people don’t think twice about consuming, ounce for ounce has as much sugar as a can of Coke – 10 teaspoons! And in fact fructose has been found to be even more damaging than regular sugar because it wreaks havoc on the liver. So again, we’re talking about 1 teaspoon of sugar in an entire pot of soup that serves a functional purpose without adding an ounce to anyone’s waistline. I made this soup for the first time last night in an electric pressure cooker that i received at Christmas and it was amazing! It was a last minute decision so i used the meat from a rotisserie chicken but next time i’ll make my own stock.